Here I am sharing few testimonials that will assure you that you have come to right place to learn Marathi. So have a look at it these success stories !! I am sure you will be eager to be a success story yourself !! Some people don’t like it, but unless you have consistent exposure that allows you to eventually “pick up” the details, you have to learn grammar. Most of the pages on the blog are actually more like excerpts from a grammar book. Marathi noun declension, verb conjugation, and sentence structure are elucidated in meticulous detail, and numerous example sentences are given. Tables are provided when needed. Reading the language is just as important as speaking. A tutorial on the Devanagari script is provided as one of the very first lessons. Even if you aren’t comfortable with the script, Kaushik provides English transliterations (eg. “mI tujhyAvar prem karato”) on almost every page. Simple conversations on an array of everyday situations are provided. Cultural references are also explained when appropriate. Formal Marathi is also different from colloquial Marathi, and such differences are delineated even at the grammatical level when appropriate. I like how Kaushik included a list of exclamations including छे and अरे बापरे! It simply makes more sense to learn a language from a sister language. In many places, the Learn Marathi through Hindi blog presents Marathi words and sentences side by side with their Hindi equivalents. Kaushik has been extremely generous with his time in answering users’ queries and sharing them on the site. For all these reasons I think that this is simply the best resource for anybody out there wishing to learn conversational Marathi. 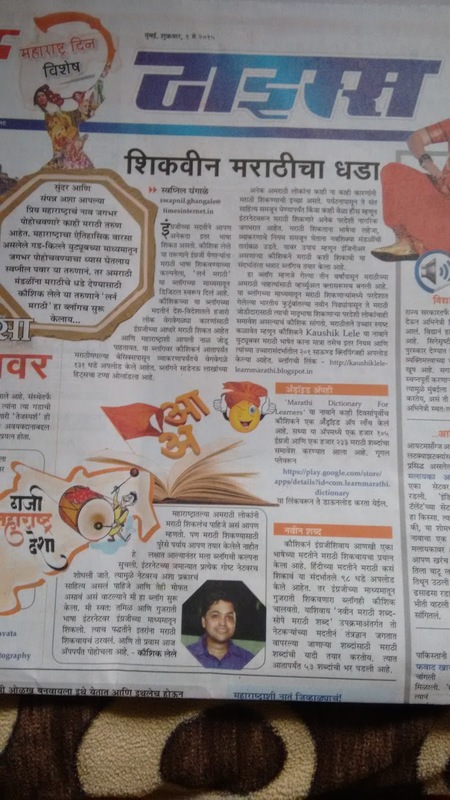 Your blog for teaching Marathi language is very commendable initiative. I was looking for a fast teaching, to enable me to write, read and speak basic Marathi conversation. I like the systematic approach to enable learners, especially those like me, who had no knowledge of the language at all. Your presentation of the basic grammar and also the numerous examples you gave for use of verbs and also in normal daily usage of words in conversations are also very interesting as well as useful. Your teachings on the website have helped me to grasp the basic of the Marathi language fast. I therefore recommend your blog and Youtube channel to learners, especially adults like me , who during our childhood had no Initiation to devnagri scripts. A few months ago, I came across Mr. Lele’s blog. When in Maharashtra, you hear Marathi being spoken all around you. My mother tongue being Konkani, Marathi is not that different, especially not when the two are written in Devanagari. Spoken Marathi, however, can be somewhat different. Understanding it and speaking it are two different things. Mr. Lele’s blog has been quite helpful to me in understanding how Marathi is spoken. The blog is written in simple language, easy enough to understand; it is designed for those wishing to learn spoken Marathi, including the beginnings of slang. Mr. Lele’s blog is an excellent starting point for such a purpose. I would readily recommend this site to both foreigners as well as Indians seeking to learn Marathi as ‘she’ is spoken. In the end, there’s no substitute for practice and experience, but understanding a little will certainly save you from making too any embarrassing mistakes. Reason for learning :- Rural posting in Maharashtra. 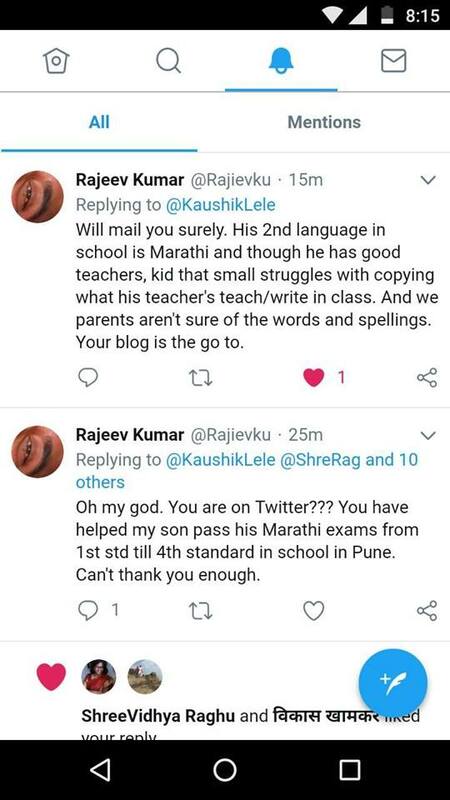 How website helped :- Helped me learned basics of Marathi. Other points you want to share:- While reading and learning Marathi relate all words with those in Hindi. That way you will be able to guesstimate any new words you came across. Hindi and Marathi looks like children of same bloodline Sanskrit, Vocabulary heavily overlaps between them. Marathi , I like this language very much and want to get pretty fluent in it. Grammar is the backbone of any language and learn-Marathi blog by Kaushik lele guides you in learning step by step through grammar in a very simple way while focusing on different aspects of the spoken language as well. For me it has been a one stop portal to clear almost all of my doubts, in short it is a good reference. While searching online for learning Marathi or even other languages I have come across many sites but this one is the best so far. I had found your website very helpful to learn Marathi. I had some little knowledge of Marathi as I was in Bombay or Mumbai as you may prefer and Pune. Then I left Maharashtra for Bangalore and thought of brushing up my Marathi for which your lessons were very helpful. I am pursuing Masters of Public Health from Tata Institute of Social Sciences , Mumbai. I really needed to learn Marathi at least for conversing it for my rural postings in Maharashtra tribal areas. At those tribal areas people speak only Marathi. My college is so busy that I donot get time to attend classes of Marathi. 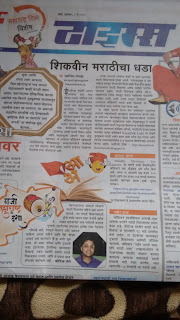 Then I found in google Kaushik lele blog to teach Marathi online free of cost. I joined and now I am at least able to get a tone of it . Though I have not become a perfect in Marathi but at least I can understand what people speak. I will still follow the blog to learn and further improve my Marathi as Learning never Ends. I would recommend if anyone wants to learn marathi free of cost,either out of curiosity of learning new language or due to demand of your job. This blog is worth. The main thing the recording which you hear their pronunciation are the best part. They make you feel that there is someone real who is teaching you. You can learn at your pace whenever you get time. But you need to practice it with others to make a feel of learning. Reason For Learning : Self Interest to know this beautiful Language. How website helped : 1. As the website has both English to Marathi and Hindi to Marathi option. It helped me by choosing easy platform Hindi to Marathi. 2. And YouTube videos helped me by the pronunciation, how to spell correctly Marathi words. Other Point : It will be more and more helpful if real-life conversation is uploaded in YouTube. such as video documentary in vegetable market with Hindi/ English subtitles to choose from. Expecting for more innovative and creative way of Learning …. Thanks a lot sir, for making this Language tutorial. It helped me a lot. I wanted to learn a new language. I resolved to begin learning Marathi as I am already quite conversant in Hindi. Kaushik, I want to thank you from the bottom of my heart for bringing up such a wonderful blog. I can imagine the amount of patience, due diligence, and effort that must have gone into putting up such a brilliant portal for Marathi learners. Being married to someone who was born & brought up in Maharashtra, I was exposed a little to the language but was not able to learn the nitty-gritty of grammar. However, after stumbling on your blog, I have learnt quite a lot. I am able to understand word by word most of the time. I have also started watching and appreciating Marathi soaps and movies. I am proud of how far I have come in learning this language and there is no turning back! I appreciate that you take every feedback positively and try to improvise your blog for everyone’s benefit. Keep this good work going. I hope many others too will benefit from this. Well done! I am learning Marathi because i want to have my higher studies from Mumbai & also i like this language. Your website is very helpful. Before, i didn’t know a common word & couldn’t make a simple sentence of Marathi.After learning from your blog , now i can speak a little bit in Marathi. I expect from you that you will add more things of Marathi languge in future . I want to tell about your blog that you have put all the things in a very well manner . One can easily learn from your blog. Help of this web site was impeccable. (a) A subjective approach with apprehensive bits of Marathi Language. (b) Very positive response to e-correspondence. Suggestion: A corner may be designated to on line/ on spot translation of hindi/ English phrases/ Sentences into Marathi. As I have to go in a Marathi family I needed to learn this language. It helped me a lot to understand and speak Marathi easily and that in influential way. I’m 20 year old electrical engineer. My love belongs to Maharashtra so that’s why i am trying to learn Marathi and i found this website. It really helps me in learning Marathi in just 2-3 days i started making simple words and impressed my love. Really a good website to learn Marathi. Thanks Kaushik. I am a PhD candidate in Social Anthropology and I am conducting my research fieldwork in Maharashtra. This is the primary reason why I am learning Marathi. Since I need to learn it fast, I started classes at a language institute (but the course turned out to be very unstructured and the teacher could not explain most of the things. As I found out, being a native speaker does not necessarily mean one can teach the language well. Now I regret spending money on that). In the meantime my brother recommended ‘learn Marathi through English’ blog. So, now I mainly follow that for learning Marathi. Thanks a lot for taking the initiative to provide such a well structured platform for people like us. I finally have hope that I too can learn quickly, with the added benefit of understanding the subtle nuances and details of the language. Kaushik has the ability to present concepts in a lucid and straightforward way, and this drives his readers to visit his blog regularly. If you’re a first time visitor, my advice is to keep reading, this blog is worth it.